On Tuesday, we got a private tour guide to ourselves. We explored the city center on foot, then headed to the northern suburbs for some local wine. We told the organizers that our primary goal was to a) hit some historical music sites and b) to find a musical gift for Andrew’s Aunt Andi, who was watching him while we were gone. They set us up with Rudi Evers, a phenomenal tour guide who was friendly and fun, and gave us a unique and memorable day, without simply sticking to what we requested. Our first stop was the Haus der Musik, a musical museum that I’d read about before our trip. The displays on the history of music and composers in Vienna* were educational, but it was the interactive exhibits that made this a must-see for anyone interested in music. They had exhibits on sound and how instruments work, and a room where you could conduct a virtual orchestra. There were several digital music rooms, where you could create your own compositions out of everyday sounds, and one where you could hear Beethoven and Mozart remixed into club music. A very cool place, and a great way to start the day. 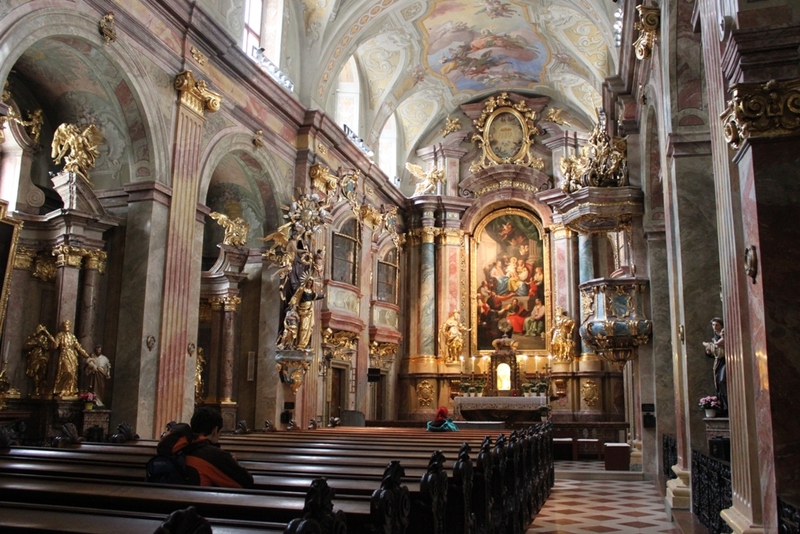 As we meandered towards a sheet music shop where I hoped to find some vintage sheet music, Rudi stopped us and took us into what from the outside looked like a small chapel and from the inside was breathtaking: The Annakirche, or St. Anne’s Church. The chapel dates from 1320 (which explains its location off of a small street) and was “Baroquified” in the 16th and 17th centuries. The wooden carving of St. Anne with Mary and Jesus was created in 1510, and the frescoes by Daniel Gran were painted in the early 1700s. The entire space was amazing, and a reminder that the roads less taken often have more interesting sites. We continued to explore the city on foot with Rudi pointing out some of the more important buildings: The Albertina, a large art museum, and the Austrian National Library on the Josefplatz. We headed toward the Stephensplatz and found a cafe for a traditional Viennese lunch — Wienerschnitzel for Tim and sausages and potatoes for me. After lunch, we headed down to the Vienna Opera House. No tours today. Strike two. A short drive later, we were in the suburb of Heiligenstadt, which is full of smaller wineries known as heurigers. These wineries are licensed to sell food and only their own wine. They’re marked by a cluster of pine branches hung over the door; if the light bulb in the pine is lit, they’re open for business. We stopped at Werner Welser, where Rudi introduced us to a beverage particular to not only these wineries, but also the time of year: sturm. Sturm is made from the first harvest of each season. It’s put into bottles that are left uncorked to ferment all summer, and it reaches its peak in September and October. It can be made from red or white grapes, but the one we had was from white. It reminded me of limonata with a kick — bubbly, refreshing, and a little potent. It was an excellent stop after a busy morning, where we could linger over our drinks and reflect on the trip so far. So Beethoven would pack up his belongings twice a year and move between the suburbs and city. The count on his addresses in Vienna and its outskirts ranges from 60 to 80 pending on who you ask. He apparently had at least five in this suburb alone. Our final stop with Rudi was one of these houses, where we peeked around the property before jumping back in the car, so that we could go get ready for dinner. susan and alan on Happy Holidays 2012!